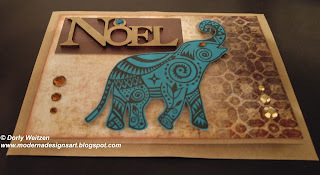 My 3rd card for this week is a Vintage Elephant Noel Card. It's a Vintage style Noel (Christmas) card in non-traditional colors, and I assume that the Elephant carrying the holiday's gifts isn't the traditional Santa's sleigh either (lol). I used a Kraft card basis, and contrasting shades of brown with strong turquoise for a non-traditional, and therefore more special color combo. The Noel sentiment was made of wood and colored on mat gold, enhanced by a dark brown framing paper and a turquoise bling. The patterned background paper is in shabby chic style, complementing the other elements. It was inked all around, to give it a distinct, eye-catching frame. 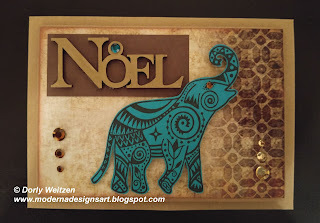 I used Michael Strong's Cloisonné Elephant stamp (large) from the Cloisonné Elephants set. I stamped it on a contrasting turquoise CS using VersaFine Ink - Black Onyx, and cut it with scissors, then added a tiny bling to enhance the eye. The Noel sentiment, as well as the Elephant, were glued 3D for extra dimension – you can see how it actually adds volume to the card. Several blings were added for extra glam. Great card! Love the layout and your colors!